Coaches in every sport have raised the tactic to something of an art form. Get in the ear of the referees or umpires and keep chirping about every call that goes against your team. Give them a good chewing out on the small stuff. Wave your arms, jump up and down, and howl in protest over the big calls that don't go your way. All in hopes of getting them to swallow their whistle later in the game or maybe even give you a make-up call, one that really shouldn't go your way but does. That fact has never gone unnoticed in the political world. 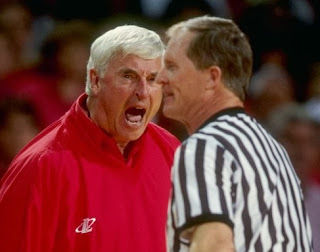 Operatives mimic the coaches' behavior, doing their best Bobby Knight impersonations, seeking to bully everyone from news reporters and political opponents to regulators and law enforcement officials into submission. We're seeing this kind of conduct on more prominent display than ever in Wisconsin politics. Whenever journalists write or say something that doesn't please the political types, they scream "MEDIA BIAS!" When regulators or law enforcement authorities look into apparent wrongdoing or, even worse, take steps to rein in misbehavior, the political players go into hyperdrive to smear the actions as politically motivated and the actors as witch hunters. Take the John Doe investigation looking into possible lawbreaking by an expansive web of shadowy front groups, some based in Wisconsin and some from out of state, that sought to influence the 2011 and 2012 recall elections. The Bobby Knights of Wisconsin politics are screaming bloody murder that it's nothing but a carefully scripted charade started oh-so-close to the approaching election year, timed to affect the outcome of the 2014 elections. Never mind that the probe evidently started in February 2012. The political Knights didn't start whining about it until just now, in hopes of duping enough people into believing that the investigators launched the whole thing yesterday. The Knights are claiming the investigators are partisans and smearing their probe as a political hatchet job that is targeting only Republican groups. Never mind that the John Doe inquiry is being led by a career federal prosecutor who once was on George W. Bush's short list for an appointment as U.S. Attorney for Milwaukee. Or that the Doe probe is being overseen by a distinguished retired appeals court judge. The Knights are trying to do to the John Doe investigation what they earlier did to efforts by the Internal Revenue Service to more rigorously enforce federal law governing tax-exempt nonprofit groups that are supposed to exclusively work to promote the social welfare, not just shill for politicians. Carefully following the script, they smeared the IRS effort as a partisan witch hunt targeting only tea party groups. Never mind that the agency also was singling out liberal groups for heightened scrutiny. The Knights never let facts or truth get in the way of good bullying opportunities. The result? The IRS is swallowing its whistle. It is neglecting to enforce either the letter or the spirit of federal tax law as it relates to nonprofit groups. It is no coincidence either that the governor now is playing games with nominations to the state Government Accountability Board. Or that legislators are proposing to take retired judges off the elections and ethics board and replace them with political appointees. Or that the GAB is being audited. They are working the refs. They are assuming it will work wonders. They are assuming the refs will swallow their whistles. If they are successful, what we will be left with is a lawless environment. A political landscape where anything goes. Where political actors cannot be held accountable for crooked dealings, and where lawbreaking is not prosecuted. Governor Scott Walker recently amended his campaign finance report for the first six months of 2013 to lower contributions made by some of his high-end donors in order to protect them from being found in violation of campaign finance law. The governor’s actions followed a report by the Democracy Campaign in September that showed 14 contributors to statewide and legislative candidates had already exceeded the state’s annual $10,000 limit on campaign contributions in just the first half of the year. The Government Accountability Board, which enforces the state’s campaign finance, ethics, lobbying and election laws, told the Democracy Campaign that it will investigate the findings early next year. Donald Kress, Green Bay, had contributed $11,000 to three candidates, including $5,000 to Walker. The governor’s latest report slashes Kress’s contribution in half and assigns the $2,500 difference as a new contribution from Kress’s wife, Carol. Eugene Mallinger, Brookfield, had contributed $12,000 to two candidates, including $10,000 to the governor. Walker’s latest report cuts Mallinger’s contribution in half and assigns the $5,000 difference as a new contribution from Mallinger’s wife, Rebecca. Albert Nicholas, Chenequa, had contributed $11,000 to two candidates, including $10,000 to Walker. The governor’s latest report reduces Nicholas’s contribution to $9,000 and assigns the $1,000 difference as a new contribution from Nicholas’s wife, Nancy. Richard Pfister, Hayward, had contributed $10,100 to two candidates, including $10,000 to the governor. Walker’s latest report reduces Pfister’s contribution to $9,900 and assigns the $100 difference as a new contribution from Pfister’s wife, Terry. Paul Schierl, Green Bay, had contributed $11,500 to six candidates, including $5,000 to Walker. The governor’s latest report reduces Schierl’s contribution to $3,500 and assigns the $1,500 difference as a new contribution from Schierl’s wife, Carol. Richard Uihlein, Lake Forest, Illinois, had contributed $10,500 to two candidates, including $10,000 to the governor. Walker’s latest report slashes Uihlein’s contribution in half and assigns the $5,000 difference as a new contribution from Uihlein’s wife, Elizabeth. As strange – and unfair – as this may sound to casual readers who don’t follow campaign finance, Walker and other legislative and statewide officeholders and candidates have done this numerous times over the years. Unfortunately, it’s usually allowed because the former state Elections Board and now the GAB decided that many of these donations can be split or readjusted after the fact because the state’s marital property law. Kind of like telling the cop who stops you for speeding that you want half the fine and the points assigned to your spouse’s driving record because you both own the car. Yeah, I bet that would work.